The team dinner in the evening was at The Chef's Table restaurant in Provo. Zagat Survey says: Enthusiastic surveyors sing praises of this Orem old-world charmer that has a panoramic mountain view and attentive servers; the artistic food arrangements have so much eye appeal they look almost too good to eat, but they are indeed delicious and superb. 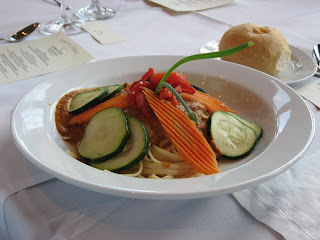 The food turned out every bit as good! Appetizers consisted of Coconut Crusted Shrimp, New England Crabcakes, and Roasted Tomato & Artichoke Bruscetta. The House Balsamic Salad was made of vine-ripened tomatoes, cucumbers, handcrafted croutons, baby lettuces and balsamic vinaigrette. 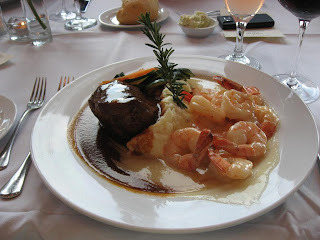 My entree was an 8 oz center cut Beef Tenderloin Filet served with a generous portion of Garlic Sauteed Shrimp. Delicious! 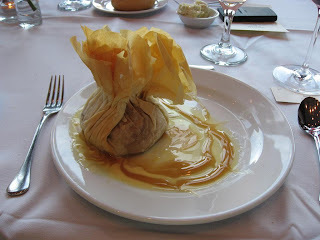 By now I was quite full and didn't think I could eat any more, but then came the interesting Warm Apple Beggar's Purse I had selected for dessert. Simply wonderful. For dessert, you can also choose a Chocolate Opera Torte that looks very tempting.